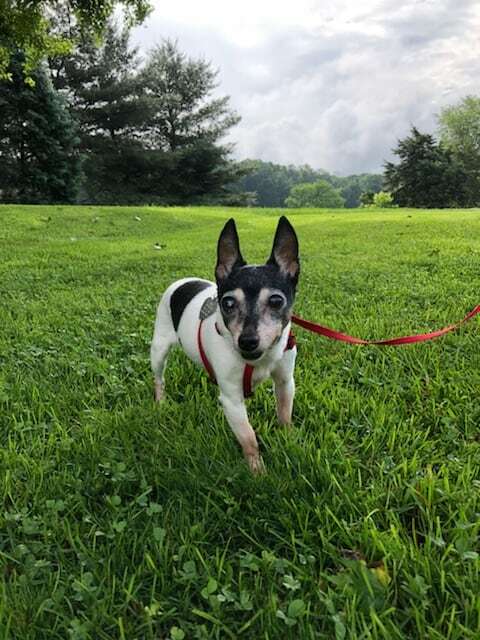 Peanut is a beautiful 12-year-old, 6-pound Toy Fox Terrier who was surrendered to a Virginia SPCA in May 2018 by her owner who developed dementia and could no longer care for her. There are so many good things to say about Peanut! She can see and hear. 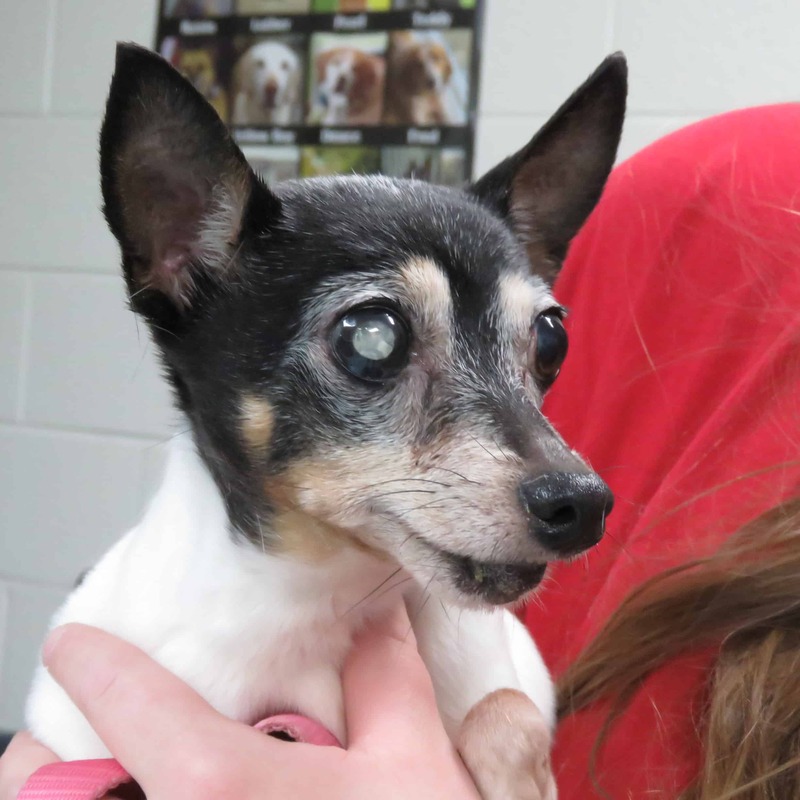 She has a mature cataract in her right eye but sees well with her left. She is spayed and heartworm negative. She just had a dental, and 9 teeth were removed. The rest of her teeth were cleaned and look great! Her heart and lungs are fine. She is just the right weight for her frame. 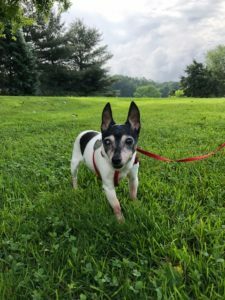 Although she is 12, she is a lively little dog who likely has many years ahead. Peanut gets along with the other dogs in her foster home. She is more interested in people, though, and likes to be held and enjoys snuggling on the sofa. She will, at the beginning, be a little nervous when she is approached, but she has not bitten or snapped. Once she is picked up, she is happy! She was, however, unhappy when her nails were trimmed at the vet clinic! Peanut is housetrained! She is fine on a leash and enjoys being outside. She sleeps quietly at night in the indoor dog pen. She has a good appetite. She is a curious dog, interested in what is happening in the foster home, and wanting to be right in the middle of the action. However, she is also happy to take a nap in a dog bed. She is smart, and has figured out the routine in her foster home. For example, she knows just when treats are supposed to be handed out! While she has not been around young children yet, the best home for Peanut will be a home without young children because she tends to be a little nervous if approached or picked up quickly. If you are looking for a delightful little dog with a big personality, then fill out an application for sweet Peanut! And until Peanut finds her forever home, she will be writing in her blog about her adventures in her foster home. Check out Peanut’s blog here. Peanut was adopted on July 15, 2018. Peanut is looking for her forever home. If you think it could be yours, read more about Adopting from BDRA before submitting your application below. BDRA relies on your donations to rescue blind dogs around the United States. Please consider giving in support of Peanut.